Adam Scott plays most of his golf on the PGA Tour and has been inside the top ten in the Official World Rankings for over 220 weeks of his career to date. In January 2007, he reached a career-best third and he now has 18 tournament wins under his belt, notably the 2004 Players Championship and the 2011 WGC-Bridgestone Invitational. For all his success, he is currently best known for his dramatic collapse over the closing four holes in the 2012 Open Championship, handing the trophy to Ernie Els. Scott turned professional half-way through the 2000 season and earned his European Tour card after only a handful of appearances. During his first full year as a professional, he won the Alfred Dunhill Championship in Johannesburg, defeating Justin Rose by one stroke. He had three further top 3 finishes to end the season 13th in the Order of Merit. In 2002, Scott won the Qatar Masters by six shots and was even more emphatic in taking the Scottish PGA Championship. A final round of 63 gave him a ten shot winning margin over Raymond Russell. He also made an encouraging debut in the US Masters, finishing tied for ninth place. In 2003, Scott won the Scandinavian Masters by two strokes over Nick Dougherty and later enjoyed his first win on the PGA Tour at the inaugural Deutsche Bank Championship. The victory included a course record 62 in the second round, eventually beating Rocco Mediate by four strokes. The following year, Scott had one of the biggest wins of his career in The Players Championship. Two ahead going down the 18th, he looked to be heading for a playoff when he found the water hazard. However, he made a superb 40-yard up and down to beat Padraig Harrington by one shot. That made him the youngest ever winner of The Players Championship at just 23 years old. Another victory followed at the Booz Allen Classic where he matched the tournament record at 21 under par. His win in the rain-affected Nissan Open over 36 holes was enough to put him into the top ten in the rankings for the first time. Scott won his fifth European Tour title at the Johnnie Walker Classic in Beijing, this time firing a course record 63 on his way to a three shot victory. 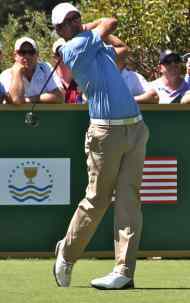 He gradually switched his attention to the PGA Tour, recording one victory and six top-three finishes in 2006. He also produced his best major championship performance when finishing tied for third at the PGA Championship. He rounded off the year with victory in the Tour Championship to finish third on the PGA Tour money list. His fifth win on the PGA Tour came at the Shell Houston Open in 2007. Once again, the tournament came to a dramatic conclusion. After sending his tee shot into the water on the final hole, he sealed victory with a 48-foot putt. He played consistently all season and secured a 10th place finish in the money list. 2008 was beset with injury and illness but he still managed a win on each tour. He opened with his second victory in the Qatar Masters, finishing with a final round of 61 to set a new personal best and a course record. On the PGA Tour, Scott won the EDS Byron Nelson Championship in a playoff against Ryan Moore. Once again, his putter saved him with a nine-footer on the last to get into the playoff and a monster putt at the third extra hole to clinch victory. Scott suffered his first significant dip in form in 2009, dropping out of the top 50 in the world and not making the top 100 on the money list. He salvaged his year with victory at the Australian Open, his first victory on home soil. He was back to winning ways at the Valero Texas Open in 2010 to secure his first PGA Tour victory for two years. He also won the Barclays Singapore Open for the third time in his career. His next significant appearance at a major championship came in the 2011 Masters when tied for second behind Charl Schwartzel. Scott was narrowly ahead with two to play but Schwartzel produced four consecutive birdies to clinch the title. Later that year he won at the WGC-Bridgestone Invitational, earning him his first career World Golf Championship and climbed back into to the world's top 10. He finished seventh at the PGA Championship and ended the year at sixteen in the money list. 2012 started well for the Australian with his second consecutive top-10 finish at the Masters, including a hole-in-one at the 16th. He then produced a career-best at the US Open, finishing in a tie for 15th but the real drama was to unfold at Royal Lytham St Annes at the Open Championship. He opened by equalling the course record of 64 and followed with a 67. A third round 68 left him four strokes clear going into the final round and his first appearance in the final pairing of a major championship. Despite not hitting the form of his earlier rounds, he still held a four-stroke advantage with just four holes to play. Having started the back nine with four pars and a birdie, he seemed to be well in control of his game and marching towards a certain victory. The pressure began to tell as he made consecutive bogeys at 15 and 16 but was still one ahead of clubhouse leader Ernie Els. Another dropped shot at 17 left him needing to make par on the last to go into a playoff. Alas, he failed to make an eight-foot putt on the final green and the Claret Jug was presented to the South African.